Open source license management provider Protecode has put together a simple overview (and accompanying infographic) on choosing the best open source license for a project. NOTE from blog editor: We’re about as keen on infographics as we are on tortoise sandwiches, but this one may just about be permissible. According to the company, when licensing an open source project, all future iterations of that project can be credited to the developer for the foundation that was created, based on the license which was assigned to his or her work. There are a variety of different licenses available for developers to choose from depending on their open source software project. 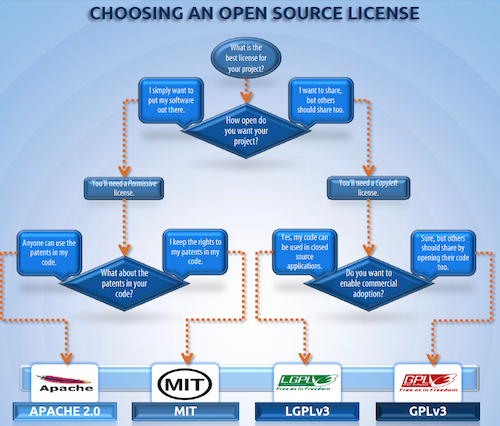 This Infographic takes a look at four of these and will help the reader choose which open source license is the best fit for their project. The Apache License is a permissive license, it requires preservation of copyright and disclaimer notices, however allows the user freedom with the software, including an explicit right to any patents. The “State Changes” clause means that you have to include a notice in each file that you have modified. The MIT License is a free software license originating at the Massachusetts Institute of Technology (MIT). It is a permissive free software license: basically, users can do whatever they wish with the code, as long as the original copyright and the license text are included in the file. The GNU Lesser General Public License (LGPL) is a compromise between copyleft and permissive licenses. It allows users to link to the original LGPL software without being required to release the source code of their proprietary software. Also, users may modify and distribute the software, but they have to describe the changes, provide the source code and release them under LGPL. The GNU General Public License (GPL) is a copyleft software license, which guarantees end users the freedoms to use, study, share (copy), and modify the software as long as they track changes/dates of in source files and release their code and any modifications under GPL. They can distribute their application using a GPL commercially, but they must open-source it under the same GPL license.